IUPATDC35 and the Painters and Glaziers Employers Association of New England were joined by Mayor Martin J. Walsh, community leaders and state and local officials to announce an exciting new partnership for students at Madison Park Technical Vocational High School on February 15, 2018. 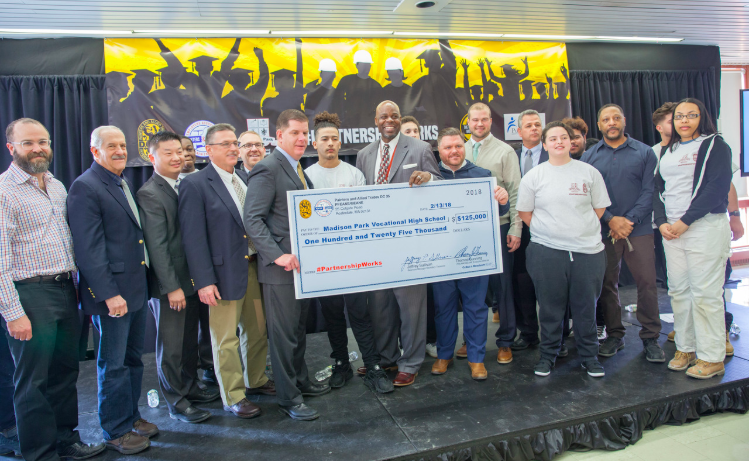 The innovative program, funded by a $125,000 donation provided by IUPAT DC35 and the Painters and Glaziers Employers Association of New England, will provide an avenue for students to obtain the necessary skills to jumpstart a lucrative career in the trades. “International Union of Painters spokesman John Doherty said the program is an extension of the union’s own program, which allows the students to complete their coursework while also working on job sites and reaching 2nd- or 3rd-year apprenticeship status with the union by graduation,” wrote the Boston Globe.